Sometimes it's all too easy to stick to tradition, to work with what you know. Consequently, you might well find yourself passing by some incredibly clever new ideas, and they don't come much more clever than Ultracut's stunning overhead routing system. You'll probably have already got the basic jist from the photos: rather than faff about mounting your router upside down on a table, you're simply dropping it into the top of the Ultracut's frame, where gravity keeps it firmly in place. Then, using the highly adaptable frame, you can slide your router across the vertical and horizontal axes, using the included stops to set your boundaries on the frame itself. 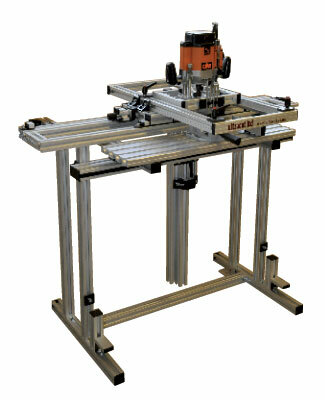 An adjustable-height table (or support legs for bigger work) means you can bring your viced piece of work up and down to meet the router as necessary, covering your third axis. 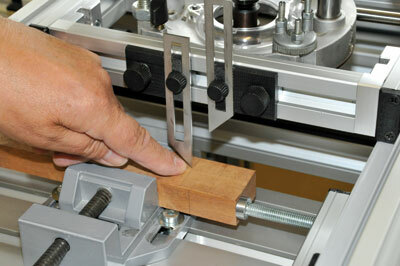 There are bolt-on accessories available that can pivot and incline your work for cutting in just about any direction, but as a base unit alone the benefits are immediately obvious: incredibly accurate measuring, a safe and natural - almost freehand - feel to making your cuts, and a confidence that you won't make a mistake: by the end of the demo test we had our stops in place, and didn't even need to look at the piece! 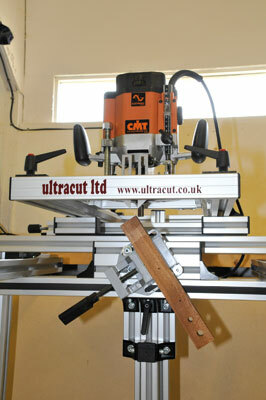 The fine work that can be achieved is astonishing, I'm already hugely impressed with the Ultracut. One of the core ideas surrounding the Ultracut is that, ultimately, it's the customer that really matters. 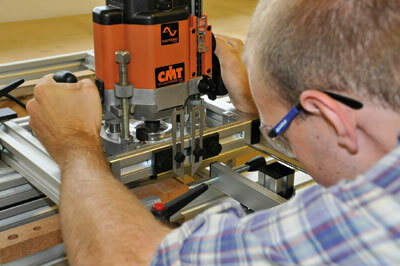 Not only will the product's designer and company owner Bill Johnson meet your custom needs as you see fit in terms of size and fixings, the basic RS800 model is capable of taking any standard router, so you can use your favourite model, and use it's own extraction too: there's no fiddling about! Ultracut leaves you feeling comfortable with a tool you know, and merely adds to the ease of use, rather than overcomplicating matters. 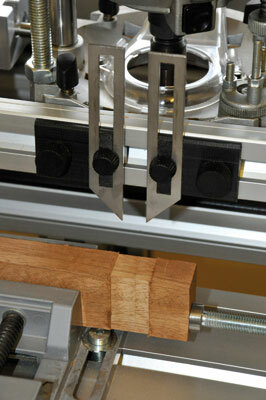 Here's where things get particularly clever: the measuring gauges (which are included for both axes) can move with the frame, so you can check your cut against a line is going to be true all the way across. Once you've lined everything up, you dropped your stoppers in place, set your depth of cut and go for it: take a look at the tricky work we accomplished in a matter of minutes! 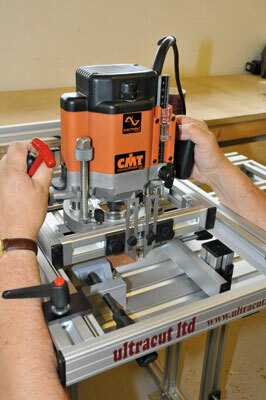 Taking the hassle out of routing manoeuvres, and capable of complex and accurate woodworking in a fraction of the time that a 'normal' approach would take, if you can afford the Ultracut, you'll find it an immense boon in the workshop. "I am already hugely impressed with the Ultracut"
The entire frame itself can be shifted as per your requirements: long cuts are a doddle!